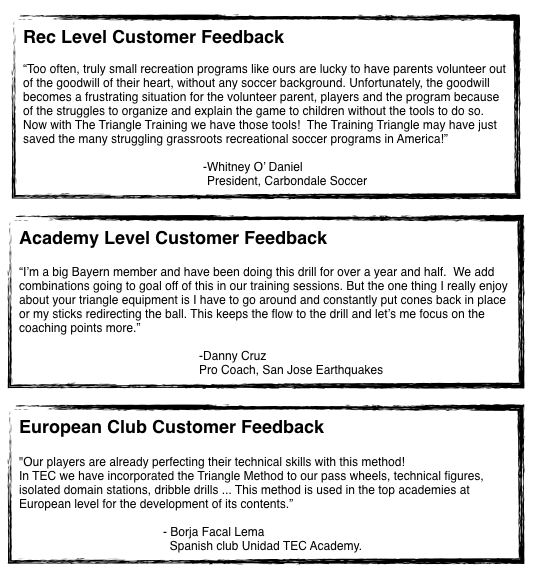 A portable and affordable framework for your club's player and team development. Mannequin Training, or pattern recognition training, is being used among the elite European clubs and best coaches in the world to develop players with the quickest feet, and most importantly the quickest minds. The Training Triangles now make this type of training accessible to all teams by occupying the same space as a traditional mannequin, but solving the portability, storage, and cost issues that are creating a barrier for most teams to implement this training style that is so fundamental to player development. Our accompanying TTM eBook and App include diagrams and videos of pattern recognition training, as well as technical training, small sided games, and much more to get your teams training like the elite right away. Think, train, and play in triangles to develop quick feet and quick minds. Help to minimize your team's risk of in-game collisions, and concussions, by training proper heading technique with our lightweight training ball, designed specifically for heading technique and to build your player's confidence.